When I think of 70s fashion, the Polo Neck comes straight to mind but mostly in men’s fashion. 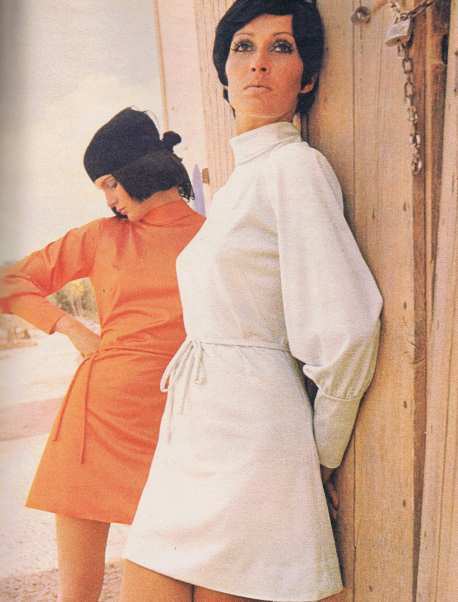 It is normally the guys you see sporting the latest polo neck shirts and jumpers so I was very surprised to see these lovely dresses with the polo necks and looking quite stylish, dating from the early 70s. These dresses were generally long sleeved gathered into deep cuffs with an option to tie a rouleau belt around the waist. This was a smart and chic look appealing to young well-dressed women who did not want to relive the hippy era but create something more glamorous and stylish. Later in the decade, you could also find polo necks on maxi dresses and these were often gathered in just below the bust line and made of lightweight material that flowed to the ground, in a way that made them look positively historic. This free flowing slightly hippyish look was all part of the dressing up and romantic look of the 70s.